While I was living in Seoul, I was able to be part of a program in which I was able to go on a sponsored tour of Kaesong, North Korea. The trip was eye opening to say the least. Although North Korea would never be able to support any major sport successfully for now (maybe after peaceful reunification which is my hope), I wondered what a North Korean hockey league would look like. I've decided to create a 14-team league. Just to be clear, in no way, shape or form, do I support North Korea. They have a long history of human rights violations, this is purely about hockey design, and any other comments will be ignored. I will be posting two teams at a time along with their special game. 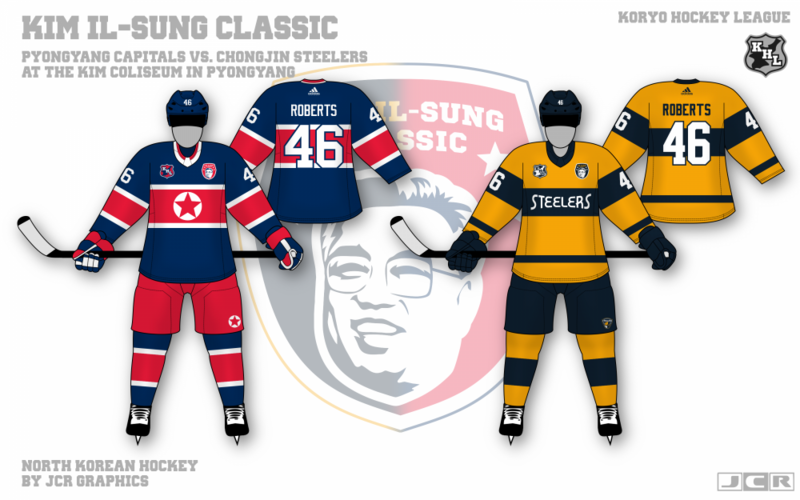 Up first are the Chongjin Steelers and the Pyongyang Capitals. I have a picture of me overlooking Kaesong. That's all. I love this, as I've loved every single thing I've seen you do since I joined. The Capitals are gorgeous. The Steelers, I love, but. I'm sure you know Korean culture much better than I do; is there a way to make their design more Korean and less American? 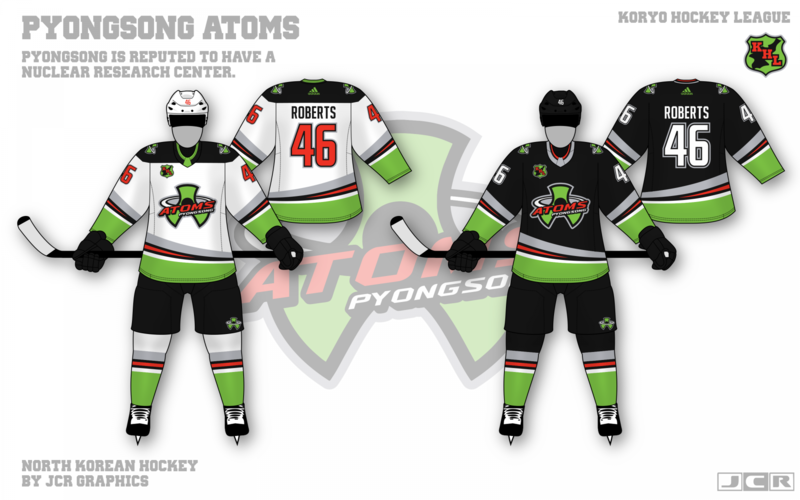 That team would fit right in with the AHL or the ECHL, but North Korea is (as I understand it) very different. Before starting this project (or any project) I do quite a bit of research. North Korean sports clubs such as the Pyongyang SC (soccer, basketball), 4.25 Football Club, and their IIHF teams all wear uniforms similar to the rest of the world which is why I used standard designs for this project. 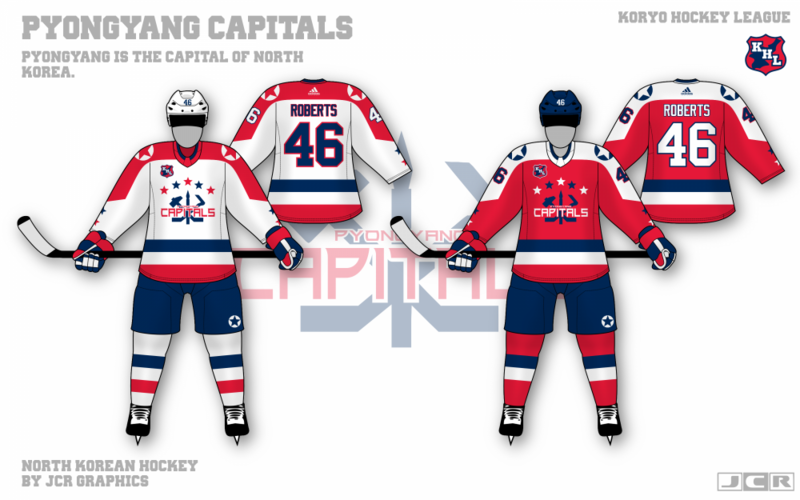 Although the Capitals are obviously inspired by the NHL Capitals, they feature North Korean symbols. Yes, the colors and stars are shared by both countries, but the circled star and the juche symbol (with hockey sticks) are uniquely North Korean. Furthermore, this is a fantasy design. 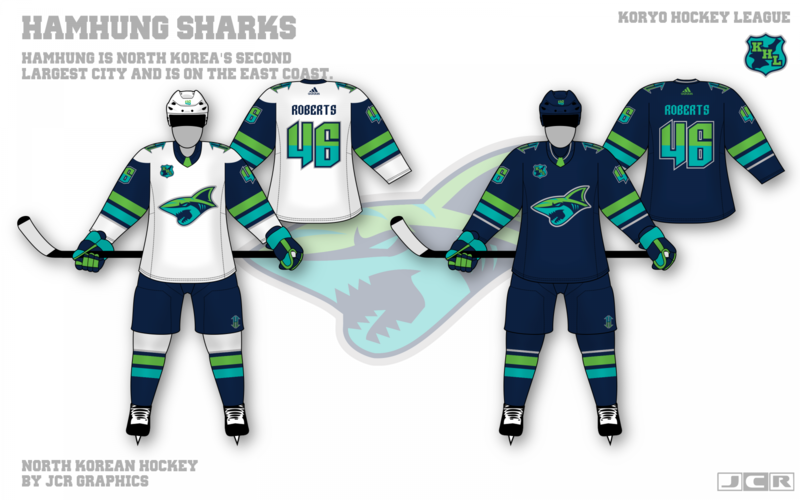 North Korea clearly couldn't support a legit hockey league, nor would use English, but this is just a fun opportunity to create designs. You have to suspend some disbelief for this. Oh, I wasn't doubting your research or your commitment, and I fully understand that it's fictional. But if you look at 4.25 & Co., North Korean sports logos aren't entirely like ours. Much less detail, much more just a few letters in a block. 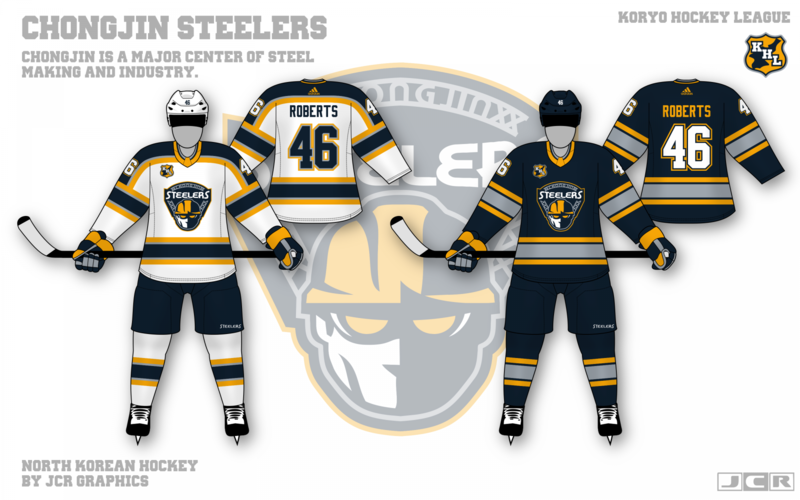 It could be interesting to see, I know it's your project, and your work is fantastic, but it could be cool to see more North Korean-looking logos for this league. 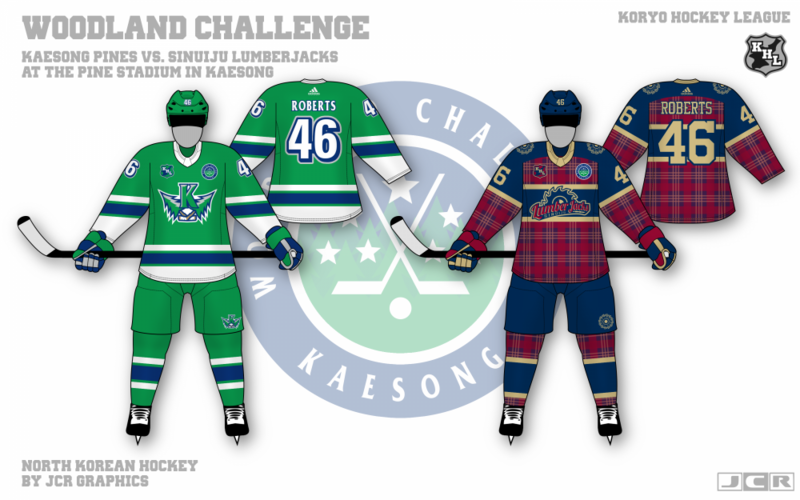 I might do a Korean night concept for each team with the names in hangul and very plain logos, but for now, I'm going with more western styled logos. 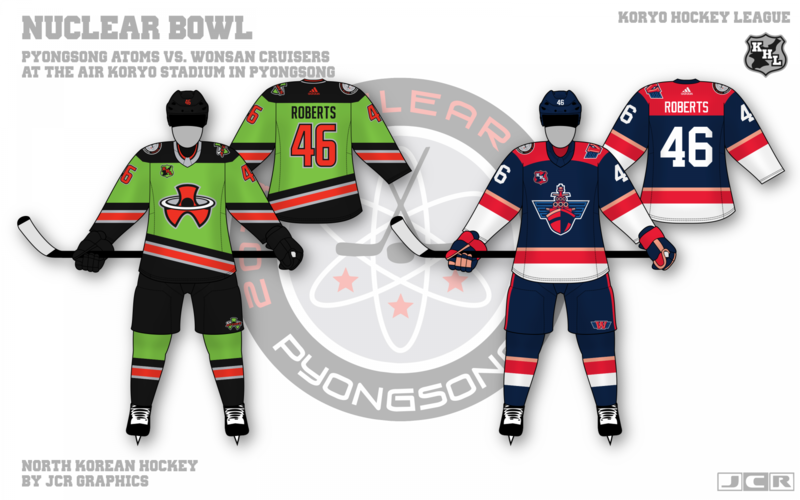 Up next are the Pyongsong Atoms and the Wonsan Cruisers. The Pyongsong Atoms feature a modern color scheme and look. 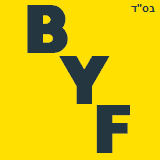 The logo is meant to represent both a letter A from Atoms, a nuclear reactor cooling tower, and the radioactive sign. 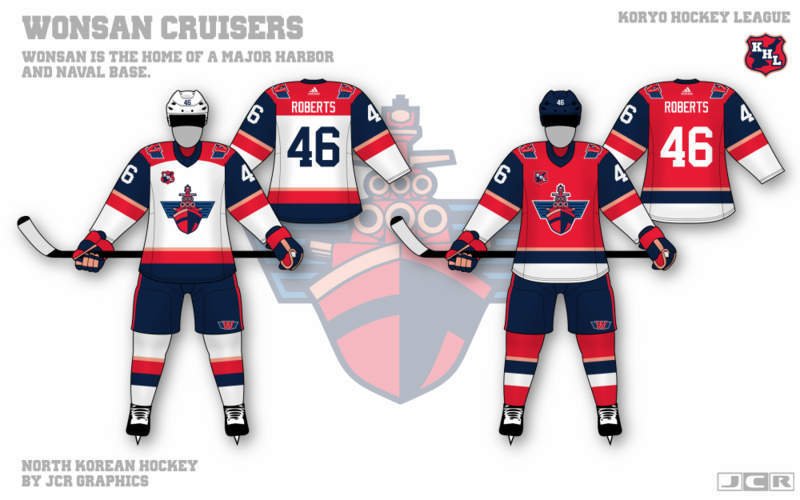 The Wonsan Cruisers feature a red white and blue color scheme with light red added as a tertiary color. They will face off in the Nuclear Bowl in Pyongsong. I really like the use of the light red for the cruisers, good job! Keep it up. Up next are the Hamhung Sharks and the Tanchon Krakens who compete for the Coastal Cup. Your work is as always really nice. I think that with the Krakens you just scored an home run. The color balance is just perfect and I would buy a jersey right away. The sharks are also pretty cool but I feel like the green and teal should never touch each other as they kind of blend together. 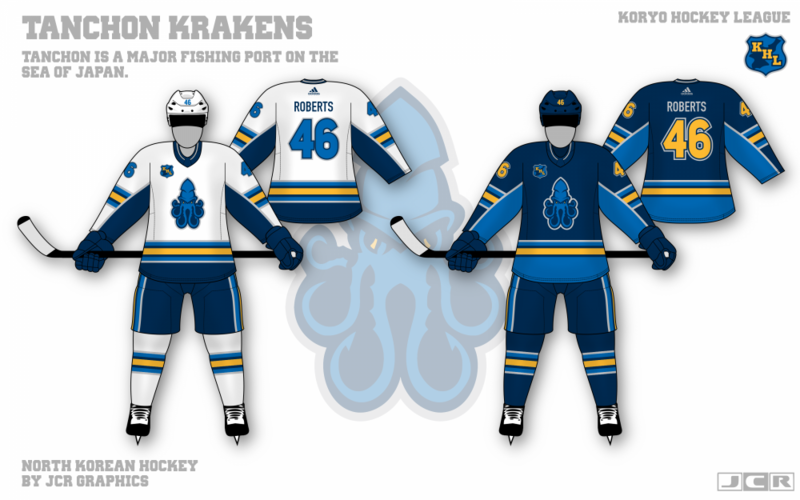 You could maybe try to have the teal on the green part of the shark head replaced by the navy. Although I would normally agree, the tiger shark stripes are meant to be almost hidden. They're not a major important detail on the logo, but more of something you catch on second glance. I really appreciate the input though! Up next are the Kaesong Pines and the Sinuiju Lumberjacks who play each other in the Woodland Challenge. 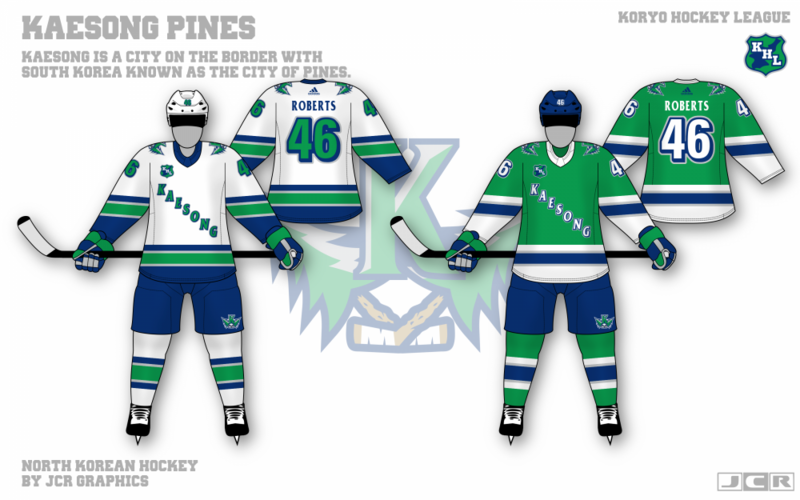 For the Pines, I went with a fairly classic look with a Rangers-esque wordmark. 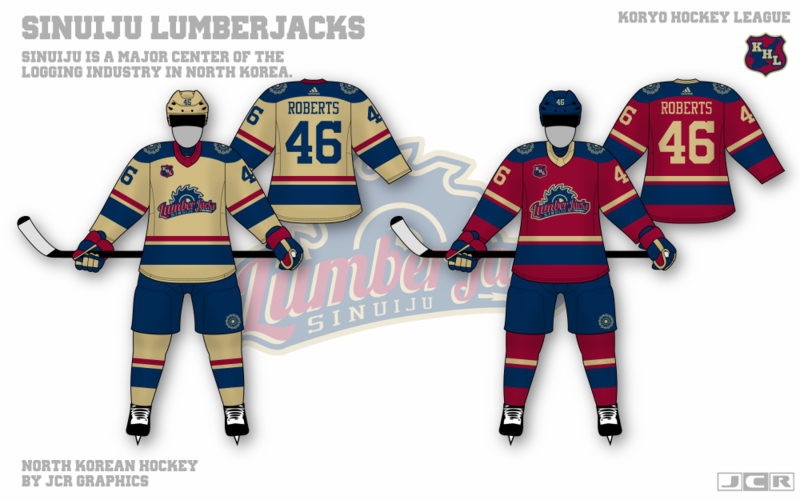 For the Lumberjacks, I went old-school using vintage colors and a retro-inspired logo. For the Woodland Challenge, the Pines are going all green with their logo replacing the text while the Lumberjacks wear flannel inspired uniforms. I really like this, but for the Pines the green pants are a little disturbing to me. I would like it more if the team names were in Korean. I don't like the Japanese Baseball League having names like Giants, Whales, etc., and displaying those names in English on their jerseys. I can handle the numbers being in English script, just don't like the team names in English, and not the native language. You... do know he specifically stated this was a fantasy design, right? So criticism is not allowed? Criticism is not only allowed, but greatly appreciated. Feedback is the reason for posting on here. It helps you grow as an artist. That being said, I addressed this. This is just for fun for me to work on some different techniquesand whatnot. This is not a realistic North Korean hockey league and shouldn't be viewed as such.